Home » Foreign » POTPOURRI OF WHAT TO SEE ON TV! POTPOURRI OF WHAT TO SEE ON TV! “The Kindergarten Teacher” Netflix. Maggie Gyllenhaal enthralls in a remake of 2014’s Israeli film of the same title. A frustrated, mediocre poet, discovers a poetic prodigy in her kindergarten class, a five-year-old boy; her good intentions go awry, resulting in a titillating, enigmatic quandary. “The Price of Everything” HBO. Director Nathaniel Kahn creates a deliciously thought-provoking documentary examining the commercial, aesthetic and lustful acquisitiveness of collectors and gallerists; we journey through the worlds of artists Jeff Koons, George Condo, Marilyn Minter, Larry Poons; experience collector Stefan Edlis’ cavalier assessment of the fluctuating value of his expansive collection; art critic, Jerry Saltz’s examination of the grey area, asking if a genuine artistic treasure belongs to the collector or the universe? “Homecoming” Amazon Prime. Julia Roberts is subtlety sensational as a counselor at the “Homecoming” Center, a government-sponsored clinic enabling a return to normalcy, those suffering from PTSD; through brilliant flashbacks we realize that a phony façade of legitimacy is morally corrupt; Bobby Cannavale is a smarmy, caddish manipulator, adding dashing but untoward effervescence to the plot. “King Lear” Amazon Prime. 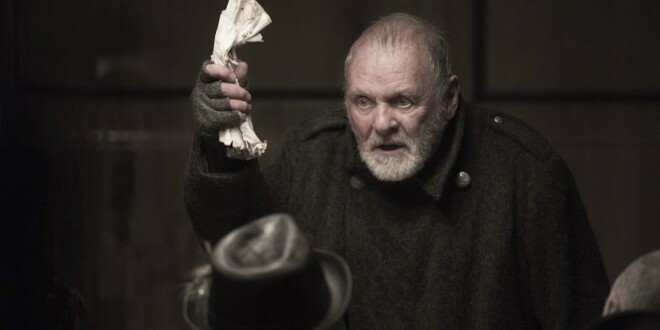 Anthony Hopkins adds to his colossal repertoire in his captivating, compelling interpretation of a megalomaniac, a King, so self-absorbed he confuses duplicity with honesty. A fine supporting cast including Emma Thompson, Emily Watson, Jim Broadbent, Andrew Scott and Florence Pugh add juicy, bloody underhandedness, skullduggery to the production. “Bodyguard” Netflix. Fascinating, intense British series revolving around the perils of a war veteran, assigned to protect a controversial politician; has it all: subterfuge, romance and remarkable surprises; the hair-raising last two sessions will arrest your heart! “Trapped” Netflix. Icelandic drama series, filmed in the pristinely gorgeous Iceland topography; enough thrills, chills and complicated conundrums to keep you riveted throughout its 10 episodes. “Secrets and Lies” Amazon Prime. Australian series focuses on benign suburbia where a horrific murder has occurred; circuitous equation will challenge the most adroit of amateur sleuths. “My Brilliant Friend” HBO. Only the Italians can manufacture a scenario where the protagonists metaphorically represent security vs self-doubt, innate scholarship vs prodigious effort, growth vs stagnation. This adaptation of Elena Ferrante’s book commences in a tough, poverty-infused neighborhood outside of Naples, Italy in the mid-1950’s, is stunningly hypnotic. “Peaky Blinders” (English) and “Babylon Berlin” (German); enormously worth a second viewing.